Mom, the Intern: When you're angry, go to bed! When you're angry, go to bed! Sometimes, when I've had a really long day and haven't gotten out of the house in a while (that can happen when it's regularly 110+ degrees outside), I like to go to Hobby Lobby all by myself and wander the aisles looking for nothing in particular. It's quite therapeutic, I must say. Though, it is a bit weird they already have their Christmas decor out. I mean, it's not even Labor Day yet! Hold your horsies, Hobby Lobby. Anyway, yesterday was just one of those days (two words: teething toddler) so when 6:30 rolled around, I told Dill I needed some Hobby Lobby time. He nodded sympathetically and off I went. As I drove, I imagined how serene the store would be -- organized perfectly and smelling sweetly of potpourri, its shoppers (always few in number) blissfully strolling along while subtle smooth jazz or elegant piano music floated overhead. I couldn't wait. I practically jumped out of the car and ran inside once I arrived. Upon entering: Ahhhhhh. Sigh of relief. Even though it baffles me, I browsed all the Christmas decorations, then made my way back to the clearance section. Finally, the thought dawned on me that my bedroom could stand to have a little greenery in it, even fake greenery. So I headed over to the fake flowers and plants section to see if anything caught my eye. I was perusing the half-off floral stems when suddenly, my reverie came to a screeching halt. A clearly disgruntled woman was standing at the register, verbally assaulting the cashier. At first, I thought it was a joke. It had to be. What adult yells at the top of her lungs at the cashier in a craft store? I hurried to the end of the floral section where I had a better view of the goings-on. Lo and behold, it was no joke. There stood a woman, probably in her mid- to late 30's, repeatedly yelling, "You are being SOOOOO RUDE. Get your manager! No, do NOT speak to me; get a manager! I am SOOOO writing a formal complaint!" The cashier forlornly picked up the phone and said over the intercom, "Code 7, register 1." I don't know exactly what "Code 7" is, but I surmise it means "I'm about to get my head ripped off, help." Soon enough, the slight-but-spunky manager appeared at the scene. Some hushed dialogue was exchanged between she and the cashier; meanwhile Angry Lady continued to interject loudly: "I am a BOUTIQUE OWNER and I spend $900 a month at this store!" "She was so RUDE to me! She's always RUDE!" "I'm writing a formal complaint!" Not gonna lie, it was really embarrassing and uncomfortable to witness. A knot quickly formed in my stomach. I'd suddenly forgotten what I'd come for. Tense situations tend to do that to me. This is why I routinely forget at least one item every time I shop at Wal-Mart. While standing amidst the floral stems, trying to watch the scene unfold without looking like a total gawker, another woman passed me and we exchanged that look. You know, the one that says, "That woman has totally lost her marbles." We had a mutual understanding: some crazy shenanigans were going down in the Hobby Lobby tonight and we we had the privilege of witnessing it. Eventually, the manager followed Angry Lady to the back of the store to resolve the price dispute she'd had with the cashier. I wandered aimlessly through the fabric section in an attempt to escape the her continuing boisterous claims of "RUDE" and "$900 A MONTH" (she did mention that four times; I counted). But alas, her ranting was so loud, it carried through the whole store and could not be avoided. I caught a glimpse of them a little later and noticed the manager handling it very professionally, nodding and smiling amicably, while Angry Lady carried on. Soon, Angry Lady left the store. Peace was restored. My "friend" from the floral section checked out shortly thereafter and I overheard her vocally supporting the cashier. "You know, SHE was rude to YOU. She was a total b!*@#. I mean, I can be b! @#y too, but I'd never do something like that. I mean, it's a freakin' craft store. Lady needs to get some air conditioning in her car or something." Of course, I couldn't help but replay the scene in my mind after it was over. There's this saying in retail and dining -- "The customer is always right." And yeah, I value good customer service and I get pretty cranky when I receive poor customer service. But sometimes, customers can be downright mean, treating store employees like trash when they don't get their way. And that's just not OK. Throughout my life I've been told, "You catch more flies with honey than vinegar." That proverb kind of paints a sick mental picture -- not to mention, who wants catch flies? -- but it serves its purpose. And it's true! Maybe the cashier WAS rude (if so, she was very quiet about it). But how does it help to be catty right back? It just ticks people off further and annoys all the lucky passersby who must suffer through your immaturity. In the end, my Hobby Lobby trip was nearly ruined by this woman's antics, but I did get a stem of some very realistic-looking poppies for 50% off! And I learned a lesson: when you yell in a craft store, you look crazy. So don't do it. If an employee is rude to you, just be pleasant in return. Kill 'em with kindness. Or take a mental note of the cashier's name, go get some sleep and call the store in the morning to complain about how you were treated. But by that point, you'll have likely realized how trivial it was and it'll suddenly drop like 10 spots on your priorities list. Which leads me to the best marriage advice I've ever received. Most people say, "Never go to bed angry." But someone once told me, "When you're angry, go to bed!" I've found it to be effective so that's the marriage advice I always dole out when asked. Being tired and stressed only amplifies problems. So when you get in a tiff with your spouse or the cashier at Hobby Lobby, just lay down, maybe take an Advil and let your mind wander off to Dreamland. Nine-and-a-half out of ten times, the problem is miraculously gone in the morning. At least, that's how it always works for me! P.S. Don't forget about the giveaway! It ends tonight at midnight! I completely agree!!! I could have written your post! Coop and I follow that advice too! What is the point of fighting when you are tired? (or grouchy for some reason, or hungry, etc...) it always makes the situation worse! 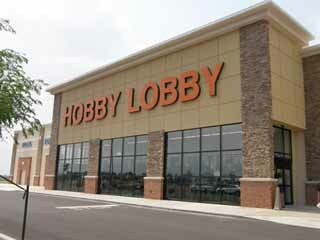 Take a nap instead, have a sandwich, or go to hobby lobby for goodness sake! PS, I do that at Hobby Lobby too. Just wander, and soak in the relaxing craft store atmosphere. Oh this cracked me up! :) Ha ha ... love the angry lady at the Hobby Lobby. "Lady needs to get some air conditioning in her car or something." Brilliant. And I totally agree with going to bed when angry. Sleeping it off can do wonders on a disagreement. Ah, what a nut. I can just see it. There are no HLs near me, but this could easily of happened at Michael's. I do have to note, though, that I LOVE HL and go there every time I can when traveling. It is so cute! This blog TOTALLY MADE MY DAY!!! Hahahaha!!! For me that wouldnt ruin my trip to Hobby Lobby it would have made it more interesting. Im a gawker. I know its bad and kinda lame, But i do it. And it would have been like watching a talk show. lol. But i have worked in the restraunt business and had one customer be so horrible to me i had to go in the back and just cry my eyes out so i understand how IMPORTANT it is to be kind to your servers, clerks and cashiers. @The Stanley Family, it was TOTALLY like watching a talk show! I am, unfortunately, very familiar with this situation. Not as the yeller but as the receiver. Its baffling to me that people think that type of behavior is appropriate in any situation and even more baffling when they have someone with them who doesn't tell them to cool the crap down. My husband and I have had a deal for a very long time that if either of us is treating someone poorly, even unintentionally or if deserved, we would not stand idly by and allow it to happen. The worst is when the person has children with them because that child grows up thinking that its acceptable to vent and storm and another human being if you feel like you deserve to. You don't. Being upset is fine but you are in complete control of your reactions and do not get to release your anger on another individual. Some people just don't understand that feeling angry and being mean do NOT go hand in hand. I have to remind myself this every time I'm accosted because that seems like the perfect excuse to treat someone poorly back (mainly for me because the yeller is almost always in the wrong), but again, its not. Being nice can be difficult, but it is also very important. Thus concludes chapter 1...riiight? Geesh. Eric and I go to sleep when we are angry. I think it's excellent advice. Or eat ice cream. It always helps calm tense situations. Something similar happened to me once. I was at kids day at the superstition springs mall waiting in the massive line for the merry-go-round and I saw a woman screaming at one of the floor sweeping women. I don't know what happened but she was screaming for the cleaner to apologize to her little girl who looked about 4 and very uncomfortable. I'm guessing she swept up her toy or something but by the way she was acting you would think the cleaner had walked up and slapped her child across the face. Anyways, I've never seen an adult behave like that and I was sickened. As soon as the cleaner walked away I approached her and told her that woman was WAY out of line. The woman burst into tears and ran away. Myself and about a hundred other adults who were semi-circled around this scene called the management and had the woman tossed out. She wasn't happy about it but I hope it sent her a message. It doesn't matter what happened, there is a way you treat people and screaming at employees is NOT appropriate. Ever. Totally rude to yell at anyone. So sad for that cashier. A.L. behaved like a toddler. She was probably overindulged growing up. I go to HL to relax as well. Target also. In fact, I'm thinking of doing that tonight. I saw John Gray on TV (the guy who wrote Men are from Mars, Women are from Venus) and he said women seek oxytocin to recharge and relax and one of the ways we do that is to shop. So wandering around in a favorite store produces oxytocin! Love it. I was once witness to a man yelling at a D.I. (thrift store) cashier. I calmly told the man he should stop being rude and that his mother would be ashamed of him. I got some applause from the other witnesses. This happens to me at work all the time! I am unfortunately the manager, so I get all of the angry customers. You would be shocked to hear what some people say! I have been cussed out, called so many disgusting names, and even threatened to be beaten up- by an adult man! There are always those other witnesses that apologize later and it makes me feel a little bit of relief, as in knowing they are crazy, not me! So to anyone who has defended the poor manager or cashier who is just doing their job- Thank you! I agree that some people do get really catty at the wrong people but I have had some situations where employees have been very rude to me. I mean, I have graciously come to their store to spend my money when I could have gone somewhere else so I do expect some kindness and respect. I am not one to blow up in people's faces but maybe the lady was right. After all, if you spent $900 at a store, you would expect to be treated with a greater respect. @Jessica, the cashier may have been very rude to this woman, but no matter how poorly we're treated, we're not supposed to reciprocate with rudeness. As a "business owner" she represented herself very poorly and it was obvious to everyone who saw it. It is possible to be tactful yet firm to get what you want, but some people cannot figure it out to save their lives.